In many Enterprises it may not necessarily be that IT and “The Business” are at war but in most they are most definitely two tribes. This does not necessarily mean there is a problem. It’s OK to have two (or many) tribes. It only becomes a problem when one tribe seeks to control the other. Even if you do not believe or accept that IT and the Business is at war, perhaps it’s because it’s more of a cold war. Whatever the status within your Enterprise, the relationship between IT and “The Business” is one of monumental importance and therefore understanding that relationship and improving it should be a strategic aim of the Business. The relationship between IT and the rest of the Enterprise is usually one of uneasy bedfellows. In fact the relationship could be thought of like a marriage than anything else. It starts out with huge amounts of love and positivity. The two cannot bear to be separated for more than 10 seconds at a time. But as time goes on, they can begin to start to see the cracks and the little annoyances. Some marriages work well, some do not. In marriage, one party can get so fed up they find another partner they do like and commit adultery. In Enterprises adultery is represented by parts of the Enterprise sourcing systems and IT for itself or using small consultancies under the wire, working directly for the rest of the Enterprise instead of through IT. The thing to remember is that it all comes down to relationships (which basically is all about communication) and if people/groups are flawed in the way they approach relationships (e.g. flawed in communication) it doesn’t matter how many flings or divorces they have, they will always have relationships that fail. It’s not a matter of if, but a matter of when. For a marriage to be successful both parties need to work on the relationship on a daily basis. Whether the marriage is between two people, two Enterprises or two groups within an Enterprise. That is why communication is the most important aspect of EA’s tenet to “Bridge the gap between the rest of the Enterprise and IT”. In fact that oft used phrase is actually fundamentally flawed. Bridging the gap intimates that the two parts continue to be separate and that there is a gap which needs to be bridged. EA will not, and does not bridge the gap. EA helps to reduce and ultimately remove the gap. There is only a slight change of words but the implications are profound. Continuing the marriage analogy, you can think of Enterprise Architects (the people), Enterprise Architecture (the process) and Enterprise Architecture (the product) as a kind of marriage counsellor or mediator, helping both parties to find a way to get back in touch with each other. EA, like counselling, doesn’t bring answers, it allow the parties to communicate in positive ways so they arrive at their own decisions about how they want to change. 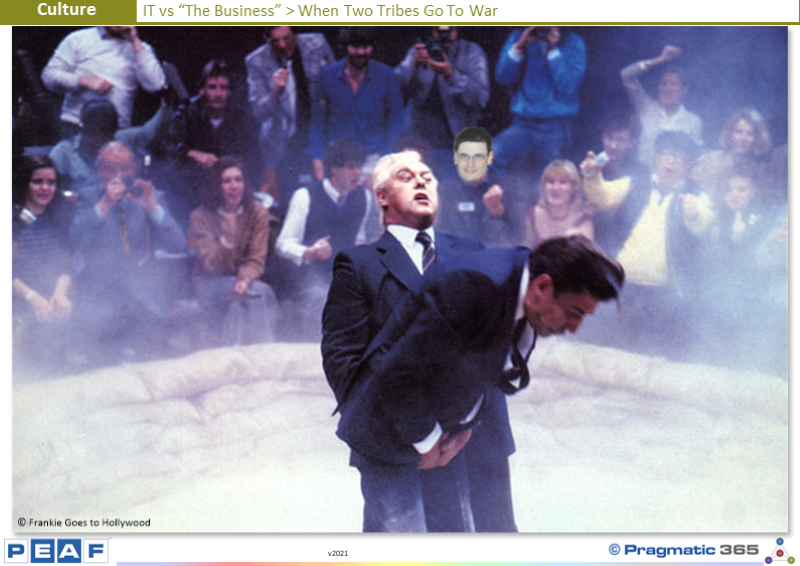 Is your IT department at war with “The Business”? Do they work together in a coherent and holistic partnership? Are they somewhere in between? Does that create any tensions or problems or issues? What do you need to do to solve them?